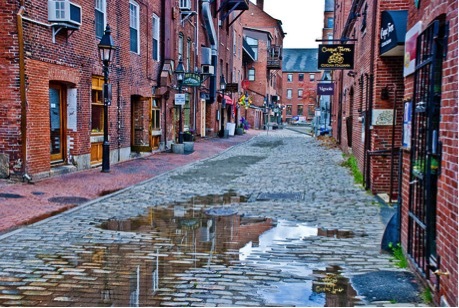 Portland, Maine is a sight to see in the springtime. This scenic city that sits atop the northeast corner of the United States is guaranteed to put you in awe, keep your belly full and make memories of one of the best darn vacations you’ve ever had. If you are looking for an economized trip to Maine, but still want to experience some luxury, a stay at the Inn at St. John would best suit you. Located in downtown Portland, this quaint and charming bed and breakfast offers old fashioned, stylish, comfortable rooms for a fraction of the price. Visitors at the Inn enjoy close proximity to Old Port, the coastline, Eastern Promenade and much more. The Inn at St. John was built in 1897 and stands as the oldest operating hotel in Portland. The Victorian hotel makes for a unique and comfortable stay, especially for those that are trying to escape the hustle and bustle of city life. The staff treats every guest with a warm welcome and displays the upmost superior guest service. You can even arrange a complimentary ride from the bus station to the Inn upon your arrival. Don’t forget to take advantage of the complimentary breakfast each morning, as well as cookies and coffee throughout the day. The lobby is designed as half café, half 19th century style sitting room if you would like to lounge around in the middle of the day or take part of a relaxing snack of cookies and milk before bed. Book your room at the Inn now, before Portland’s busy season begins. Just a mere 20-minute drive south will bring you to Cape Elizabeth, Maine. This edge of the coast city offers stupendous views of the glistening Atlantic Ocean, as well as Portland Head Light and Fort Williams Park. The views that Cape Elizabeth has to offer will leave you speechless as the cool breeze from the ocean brushes over you. 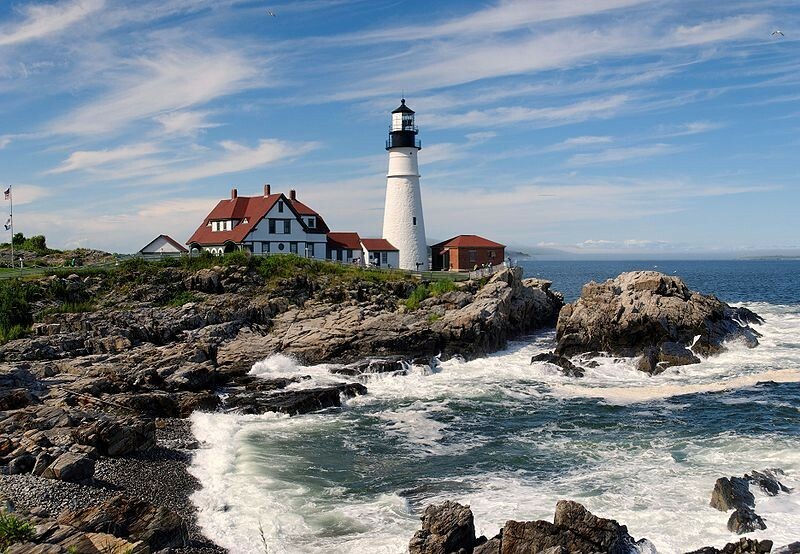 While the Portland Head Light is a sight to see as well, there are only few occasions when it is opened for tourists to actually go inside. Not to worry, this structure that stands at 80 feet tall is a beauty to look at by itself, up close and from afar. Visitors can also enjoy the museum located right next to the headlight, as well as a nice grassy area that’s perfect for picnics. Five Fifty-Five is an American restaurant that is only open for about 5.5 hours each evening. Five Fifty-Five invites visitors and locals with a hearty menu that will leave you wanting more, even though your stomach might be saying otherwise. Some notable items on their menu include bang’s island mussels with pickled cherry peppers, roasted garlic, a grilled baguette and chives. Or you might want to try their rich and creamy mac and cheese with an artisanal cheese blend and black truffles, which you can add butter poached Maine lobster to. Why not order their juicy roast long island duck or hanger steak that is marinated for 3 days. If that isn’t enough for you, their dessert menu will be. Five Fifty-Five serves up everything that will satisfy your sweet tooth, whether it’s the chocolate mouse parfait, creamsicle, crispy chocolate chip cookies or their ice cream and sorbet trios. I promise you won’t be disappointed. Five Fifty-Five received a certificate of excellence from Trip Advisor in 2014, as well as the winner for Diner’s Choice in 2014. 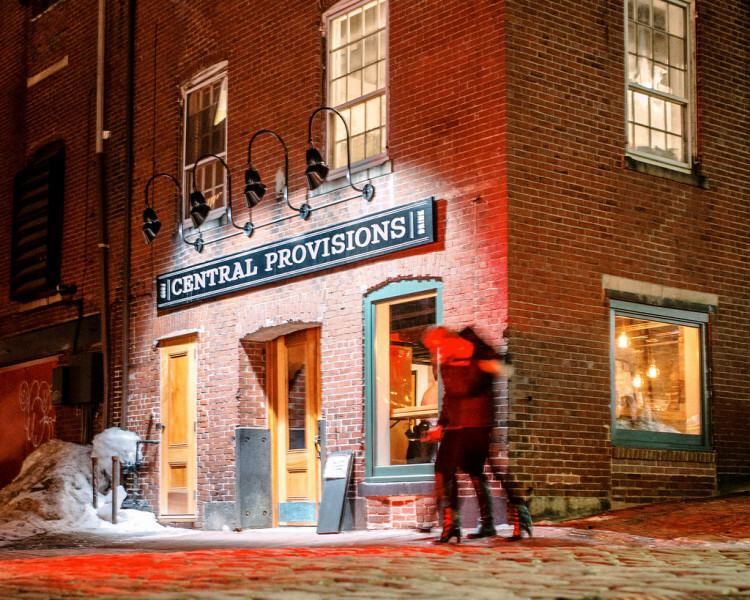 Central Provisions is another restaurant that the locals will recommend to you during your vacation to Portland. Their “small plates” menu has a wide selection of raw, cold, hot and sweet plates, as an encouragement for the guest to try as many items as they would like. One of their most popular menu items is the suckling pig, which is made with apple, brown butter and marcona almond. If you are looking for some fresh seafood in Portland, Central Provisions also offers Yellowfin Tuna Crudo, fresh Otter Cove Oysters and fresh Caviar from Browne Trading Company. While Central Provisions has a mixed cocktail list that will knock your socks off, they also offer a selection of mocktails such as the Ricky, which is apple shrub, cranberry lime cordial, soda water over crushed ice and a Cold Fashioned which consists of apple cider, pomegranate juice, orange slice and old fashioned bitters. Duckfat, located on Middle Street in Portland, gained notoriety for a restaurant that uses real duck fat to fry their Maine potato fries, making the outside of the fry crisp and the inside fluffy. 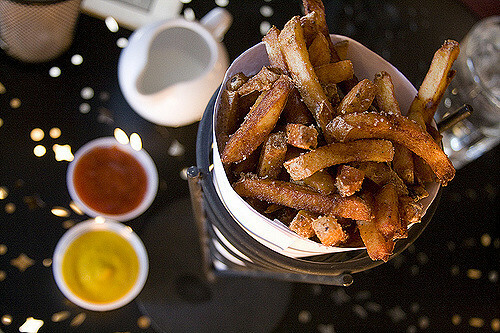 The fries are then sprinkled with Duckfat’s own seasoning salt and can be dipped in eight different dipping sauces. The fries were the owner’s main inspiration to open Duckfat in downtown Portland. Trust me, these Belgian fries are to die for and go great with one of Duckfat’s signature milkshakes, which are made with local gelato, courtesy of Gelato Fiasco. Restaurant patrons have their choice of 7 different milkshake flavors, including “The Original” Duckfat Milkshake, Wild Maine Blueberry and Sea Salt Duckfat Caramel. Even though it may be difficult to find room for dessert after each restaurant you visit in Portland, Duckfat is a must visit for all visitors. Now I know what you are thinking, what about lobster? Finding a good lobster joint in Portland isn’t a tricky task, although there may be some spots Portland locals will tell you to avoid. 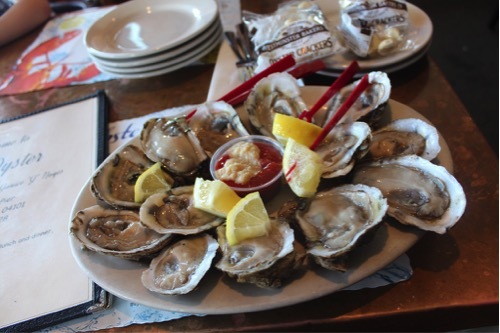 J’s Oyster offers full sized lobster at a fair price, as well as oysters, their famous steamed clams, Alaskan King Crab Legs and much more. This modest restaurant serves as a local favorite for seafood, along with a full service bar and a view of the waterfront. Please, do yourself a favor and stay away from the mainstream chain restaurants when visiting Maine with all the fresh seafood, crispy French fries and other impeccable eats Portland has to offer, there is simply no time for a Big Mac. 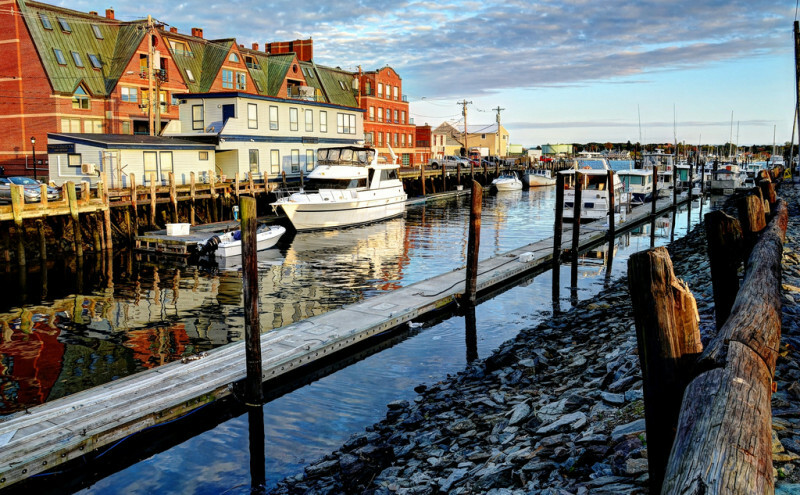 The best times to visit Portland, Maine are between April and September each year. For more information on a trip to Portland head here to the official tourism page.